IMAGE: Hanchen Huang and colleagues, experts in nanotechnology, have developed a glue that binds metal to metal to glass to you-name-it, sets at room temperature, and requires little pressure to seal…. "MesoGlue was founded by Huang and two of his PhD stu­dents: They had a dream of a better way of sticking things together." Those "things" are every­thing from a computer's cen­tral pro­cessing unit and a printed cir­cuit board to the glass and metal fil­a­ment in a light bulb. The "way" of attaching them is, aston­ish­ingly, a glue made out of metal that sets at room tem­per­a­ture and requires very little pres­sure to seal. 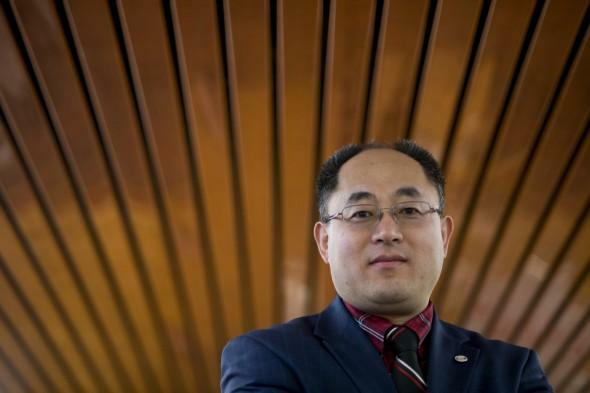 "It's like welding or sol­dering but without the heat," says Huang, who is pro­fessor and chair in the Depart­ment of Mechan­ical and Indus­trial Engineering. In a new paper, pub­lished in the Jan­uary issue of Advanced Mate­rials & Processes, Huang and col­leagues, including North­eastern doc­toral stu­dent Paul Elliott, describe their latest advances in the glue's devel­op­ment. Our curiosity was piqued: Sol­dering with no heat? We asked Huang to elaborate. "Both 'metal' and 'glue' are familiar terms to most people, but their com­bi­na­tion is new and made pos­sible by unique prop­er­ties of metallic nanorods–infinitesimally small rods with metal cores that we have coated with the ele­ment indium on one side and galium on the other. These coated rods are arranged along a sub­strate like angled teeth on a comb: There is a bottom 'comb' and a top 'comb.' We then inter­lace the 'teeth.' When indium and galium touch each other, they form a liquid. The metal core of the rods acts to turn that liquid into a solid. The resulting glue pro­vides the strength and thermal/?electrical con­duc­tance of a metal bond. We recently received a new pro­vi­sional patent for this devel­op­ment through North­eastern University." "The stan­dard polymer glue does not func­tion at high tem­per­a­tures or high pres­sures, but the metallic glue does. The stan­dard glue is not a great con­ductor of heat and/?or elec­tricity, but the metallic glue is. Fur­ther­more, the stan­dard glue is not very resis­tant to air or gas leaks, but the metallic glue is. "'Hot' processes like sol­dering and welding can result in metallic con­nec­tions that are sim­ilar to those pro­duced with the metallic glue, but they cost much more. In addi­tion, the high tem­per­a­ture nec­es­sary for these processes has dele­te­rious effects on neigh­boring com­po­nents, such as junc­tions in semi­con­ductor devices. Such effects can speed up failure and not only increase cost but also prove dan­gerous to users." What are some appli­ca­tions of the technology? "The metallic glue has mul­tiple appli­ca­tions, many of them in the elec­tronics industry. As a heat con­ductor, it may replace the thermal grease cur­rently being used, and as an elec­trical con­ductor, it may replace today's sol­ders. Par­tic­ular prod­ucts include solar cells, pipe fit­tings, and com­po­nents for com­puters and mobile devices."